Hi everyone! 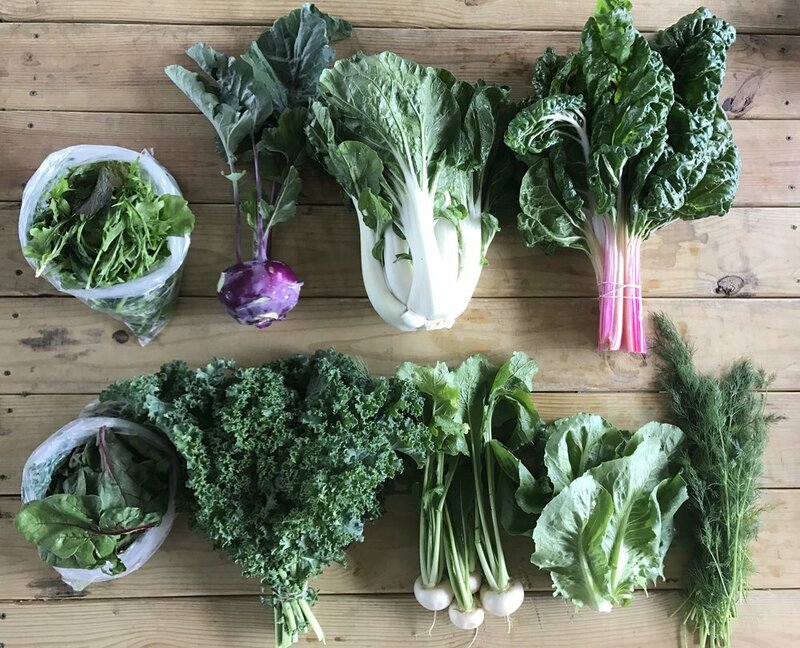 Welcome to week 1 of your CSA! We are so excited to be starting a new season with new and returning members. Thank you so much for joining us on this journey and we look forward to a great season! Van and I took into account the past couple of years' weather patterns. We started to work the ground and get rows up about 2-3 weeks earlier than we normally do, and thank goodness we did! We were able to have rows up and plants in the ground about 2 weeks earlier as well. This was all before these rain storms moved in. There were weeks where we weren't able to do anything after it rained. We did have a really bad storm come through Flora a few weeks ago and we got about 8 inches of rain and hail damage. We had planted a few thousand collard, broccoli, and cantaloupe plants that we did lose due to flooding and hail. That is a big loss, but we often have to remind ourselves that it is all a part of farming, and mother nature is our boss and what she says goes. We took a gamble and planted tomatoes early as well. Early as in a few weeks before Easter. We look forward to an early harvest! We also were able to plant watermelons earlier than we normally do, and we can't wait to have sweet and juicy watermelons just in time for the 4th of July! Now we wait for more ground to dry so we can continue to plant our summer crop. 1. Kohlrabi- A unique and favorite vegetable of ours. It is wonderful to eat raw, tastes like a mild broccoli, in salads or dipped in hummus. It makes for a wonderful potato substitute. You can mash it, bake it, fry it, sauté it, etc.. make sure to peel until you get to a crispy center, and don't discard the greens they are also edible. 2. Bok Choy- A tasty Asian green. The entire plant is edible. The greens will be a bit spicier than the ribs. Wonderful in stir fries and also great roasted in the oven. 4. Swiss Chard- A really colorful and earthy tasting green. It is great raw in salads or used as a lettuce wrap, but also cooked down like spinach and added to a variety of dishes or all by itself. 5. Green Curly Kale- Great used in salads, soups, or sautéed as well. 6. Dill- I LOVE this herb. It is delicious on roasted vegetables and is my absolute favorite to chop up and toss into a salad. 7. Braising Mix- A mix of Mizuno, Kale, Red Mustard, Choi, and Arugula. This mix is flavorful and colorful. You can really use any of our greens to braise. Add any greens to this mix if you need to stretch it further for a meal. See easy recipe below. I personally use coconut oil or butter. 8. Spinach- A beautiful red veined spinach. 9. Romaine Lettuce- A tasty head of lettuce grown in the field. Below are a few pictures from around the farm. First picture is of our cover crop being turned and getting ready for new rows. Second is of Van and Isabella planting. Third you will see a recent full moon over the farm. Then pictures of Hazel loving the recent rain and napping at the farm in an old push cart. The last picture is of the oh so tasty Hakurei turnips being sautéed for supper. They are delicious and beautiful!